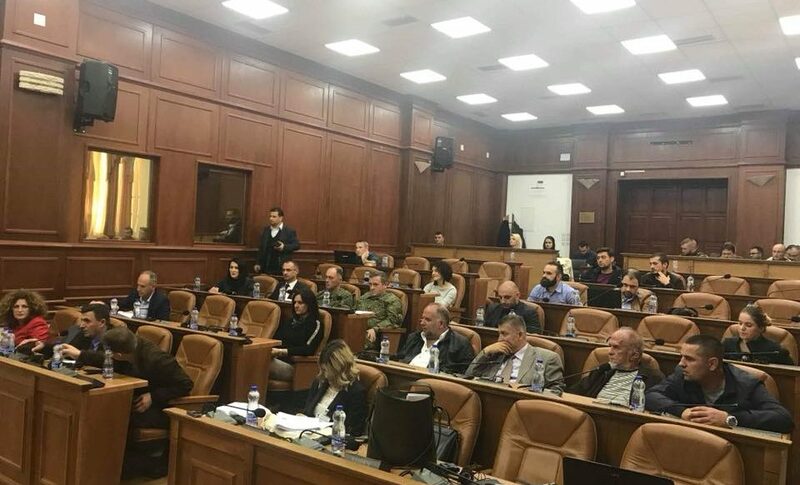 The Kosovo Democratic Institute (KDI), in cooperation with the Parliamentary Committee on Internal Affairs, Security and Oversight of the Kosovo Security Force, held a public hearing in Kosovo on the Draft Law on Kosovo Security Force. At the opening of this public hearing Adelina Hasani from KDI said that, it has been done more than a month since the package of the three draft laws for KSF have gone to the Assembly of Kosovo, which has passed in the first review. The organization of this public hearing is done so that the treatment and discussion of the package of the three draft laws be more comprehensive. While Haxhi Shala, deputy of the Kosovo Assembly from the Social Democratic Initiative, chairman of the Committee on Internal Affairs, emphasized that after the adoption of the package of the laws in the Assembly, the committee that he leads is in the phase of amending these laws. “The KSF is a constitutional institution and this legal package only advances the role of the KSF. Knowing the importance of these laws is important to take the opinions of citizens and all the important actors in this process, “said Shala. As well as he said that from the moment when these laws are adopted, Kosovo will become an army regardless of the name that will not change. While the deputy chairman of this commission, the MP from the ranks of Self Determination Movement, Rexhep Selimi, emphasized that the commission is doing a good job in holding these public hearings at this phase due to the importance of these laws. “This package is very important not only for the KSF but also for all the people of Kosovo. It is very good that we have come to this stage that we are already treating these laws in the Assembly. The KSF does not belong to one ethnic group but it belongs to all citizens and in the defense of all citizens, “he added. The other member of the committee PDK deputy Fatmir Xhelili stressed that it is very important for the KSF to now advance its role as it has worked hard to prepare for the transformation and advancement of the role in defense of the citizens of the Republic of Kosovo, always in cooperation with the international allies of the state of Kosovo. He also added that KSF is open to all communities that live in Kosovo. Further in the discussion, participants in this public hearing by civil society organizations and representatives from all groups of communities who live in the Municipality of Prizren addressed questions and gave comments related to the laws towards the members of the parliamentary committee. Likewise, the MPs responded to the interests of the participants regarding the issues raised towards these laws. This activity was realized within the project “Support to Parliamentary Research in Kosovo”, funded by USAID. This project aims to increase the quality of laws approved in the Assembly of Kosovo, by providing more information to MPs.